Front & rear views of the Elinchrom Portalite pressed into action. Anyone who follows this blog knows how much I like using the Elinchrom Ranger Quadra system for a lot of my work. Next week I have a job coming up where I need to be able to pack light and rush around and I have been perfecting using the Canon radio slave system so that I can just use my Speedlights and a couple of tiny stands on the job. Whilst playing around I thought that I’d see how easily I could attach an old Elinchrom Portalite softbox to the Canon and the answer was “frightningly easily”. The Canon Speedlight 600EX II-RT comes with a diffuser cap and just popping that onto the flash after the flash tube section had been pushed through the plastic Quadra mount held the softbox rather well. I could easily add some foam tape or some velcro but this will stay in place unless I shake it around. It’s a bit smaller than I’d like a softbox to be but it is supremely light and so I’ll just have to get it that bit closer to the subject. The Portalite folds up really small too and so I have another choice when I’m shooting. I will probably use a Westcott double folding umbrella most of the time but it really does pay to have options. Best of both modifiers work absolutely brilliantly with the Canon wireless remote set up with the ST-E3-RT transmitter and the RT flash. From testing today the recycle times on the 600EX II-RT are better than any Speedlight that I’ve ever used before and because of that I’m more than happy to work this way for this specific job. Think Tank Logistics Manager 30. A few weeks ago I bought some more Elinchrom Ranger Quadra kit and after a short while lugging my gear around in multiple bags and cases I decided that it was time to get myself one big case to take most or all of my Quadra gear. My rationale was that I am pulling one bag on wheels and carrying two or three others so why not make it one on wheels with the lighting and one smaller bag with cameras and lenses riding on top of it or over my shoulder as required? There’s quite a bit of choice on the market but all of my experience with Think Tank bags told me to start my search there. They make lots of rolling bags but only three specifically designed to lug large amounts of kit. My benchmark was that I had to be able to get at least two of my Manfrotto 156 stands plus a couple of Manfrotto 001s in there along with two or three packs, three or four heads, spare batteries, cables, light modifiers and plenty of accessories. When I get a new piece of kit worthy of mention, I usually write a first hand account of how it is working out and go into details based on using it on a few jobs. I bought an Elinchrom Quadra ELB HS kit a couple of weeks ago and I thought that it was about time I gave some first impressions on this blog. Sadly, I haven’t used it for anything particularly interesting and I certainly haven’t stretched it beyond what I would normally do with my old Quadras (some executive portraits and a quick location shoot) but I can already see a lot of small but amazingly significant changes from the original system. I have the new High Synch head too which brings one key improvement which is the ability to synch with my cameras at shutter speeds right up to 1/8000th of a second using the EL Skyport Plus HS Transmitter and I’ll talk about these a bit further down the page. 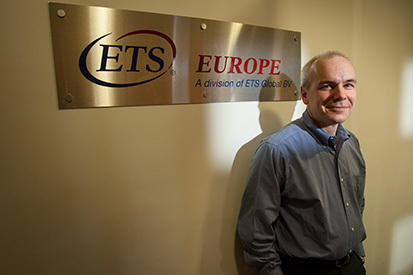 Not long after I took redundancy from my staff job at The Times Educational Supplement I spent several days putting together a collection of possible portfolio pictures. I was a long task as I’d been there for over fourteen years and when I eventually published my folio on line I had cut a couple of hundred photographs down to thirty. Whilst I was looking for something else today I came across that folder of 223 pictures and had a good root through. Techie stuff: Canon EOS1D MkII with a 70-200 f2.8 L IS lens at 70mm. 200 ISO 1/250th of a second at f8. Lumedyne flash. 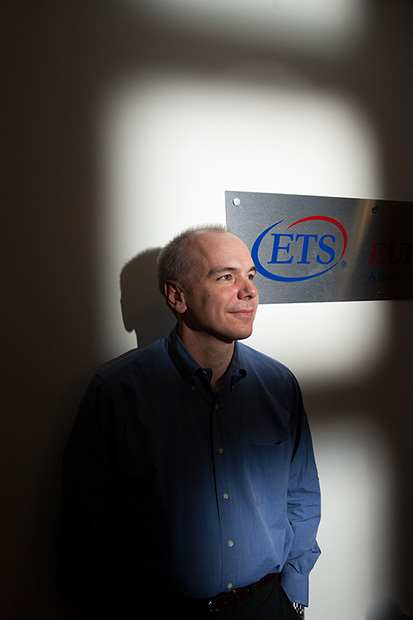 The idea here is to have two separate lighting set-ups for one interview portrait without having to constantly move around the room adjusting lights. This interview was with a senior businessman who chairs a body that decides how much teachers’ pay rises will be each year. The reporter wasn’t all that comfortable with me shooting through the interview but it was what the picture editor wanted, so that’s what I did. This job required a bit of quick thinking so that I could get two different set-ups in place. 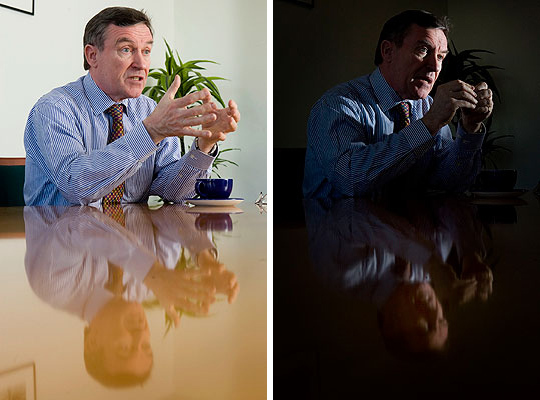 The picture on the left was lit using a single Lumedyne head at 50 joules bounced off of a wall almost in front of the subject. 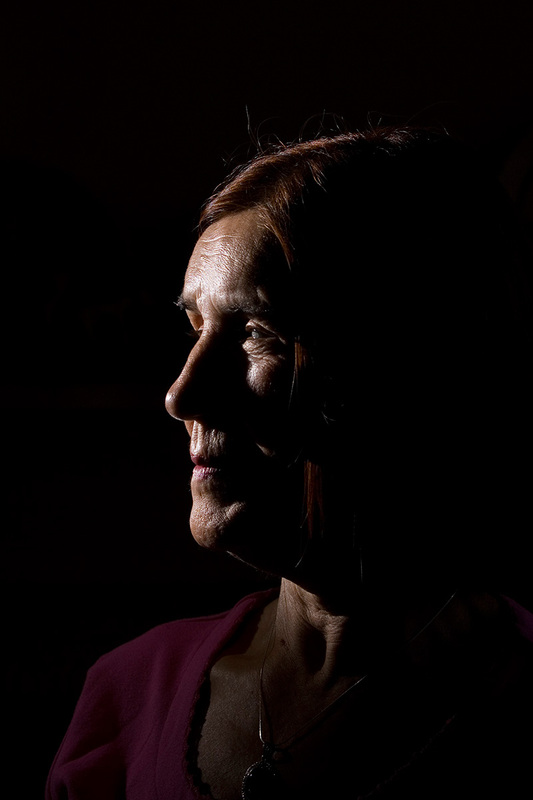 The image on the right was lit by a single Canon 550ex flash gun with a Honl Photo snoot attached aimed directly at the subjects face and set further away from the camera. Both flash units were fitted with Pocket Wizard receivers set on different channels from each other. The idea here is that by simply switching between channels on the transmitters I could switch between two very different lighting styles without moving. The left hand image is far more evenly lit. The large expanse of off-white wall made a very good and large light source. The exposure here was 1/60th of a second at f5.6 on ISO200. There was some available light play – without flash the scene would have been two stops under exposed with that amount of flash. 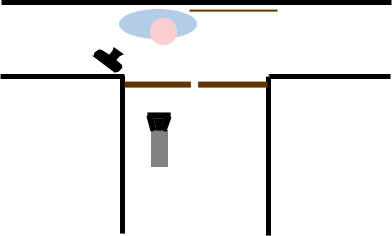 You can see from the diagram below how the room was laid out and the flash head was positioned at about 10 degrees above the subjects eyeline. The right hand image is far more starkly lit. The exposure was 1/250th of a second at f13 on ISO 200. There is almost no available light in this picture and the lighting effect is dramatically different. The very narrow angle of the light offered by the Honl snoot makes it difficult to always get the subject right in the centre of the small pool of light and so you need to be careful when aiming it to centre it on where the subject is most likely to be. 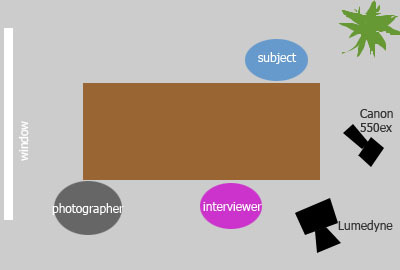 The layout of small conference room where the interview took place. The point of this technique is that you can arrange more than one style of lighting and then switch between them at will simply by selecting a different channel on the trigger. I find that I use the Honl snoot a lot more than I had imagined that I would. It fits into a bag very easily and it is simple to use. 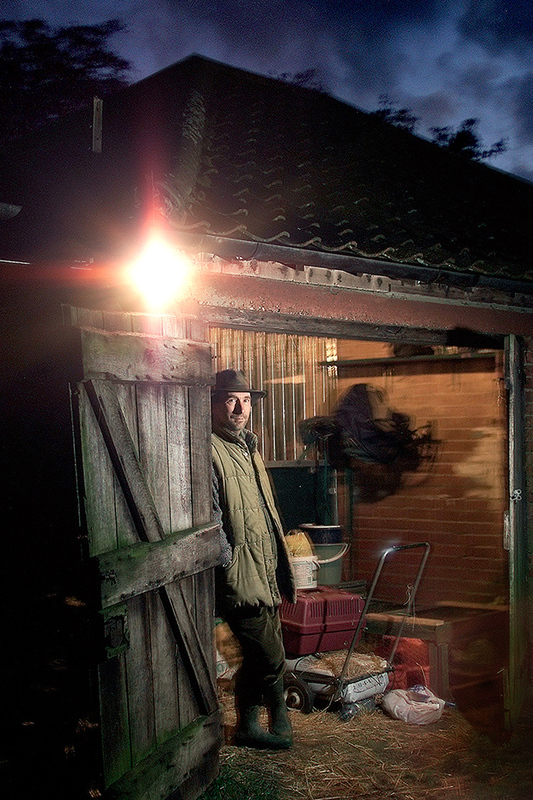 When you are in complete control of the lighting, it’s very easy to achieve dramatic results. This style of light might not be to every picture editor’s taste and so the evenly lit alternative is a very good idea.